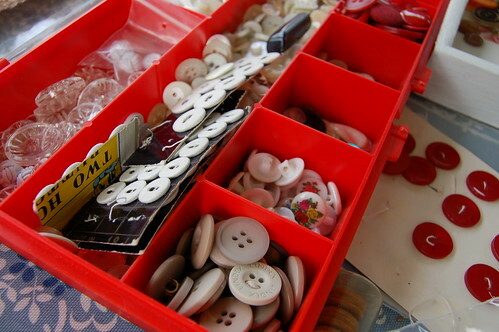 As I sat silently sewing green buttons to a knitted sweater my mom went into her sewing room several times. She came back with bags and boxes. She filled the table with her ever growing button collection. She emptied a plastic bag that she thrifted for next to nothing this summer. It was filled with brown, black and metal buttons. They spread on the decoupaged tray. Mom was in a mood for sorting. For a while even my dad was there, looking through, picking up and putting down. I took out my camera, what else? Buttons fascinate because there are so many variates on one theme. They come in different sizes, materials and colors. I think we like them because a jar of buttons is intertwined with our childhood collector. Like tiny treasures they can be sorted in a thousand different ways. You can play games with them, trade them, display them in glass jars on a shelf or use them in practically any craft project! Any project you ever do could be better if you add a button. Sew it to fabric, glue it to wood. Some buttons look like candy or sea shells. 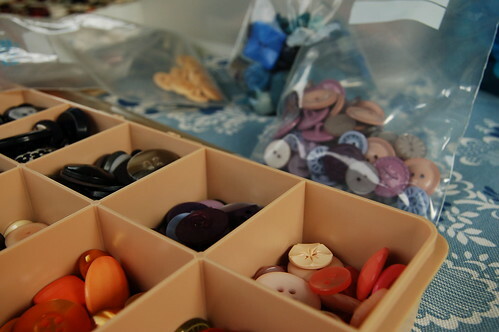 Men’s hardware boxes are perfect for women’s button collections. Screw (don’t nail) the meant intention, see the possibilities! Same size and color in plastic zip-lock bags. 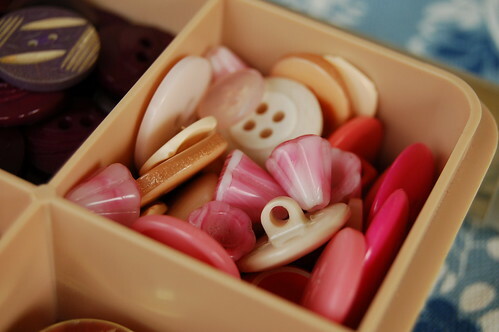 It’s easy to thrift black buttons, but what I want is a collection like this of red, green and pink buttons! Order in mom’s button box once again. I had to play some with the buttons too. I lined up a couple by color. A yellow set. A purple one. My favorite buttons are the more heavy glass buttons. Transparent and shimmering. I even created little button bracelets but I’ll post my photos of those tomorrow. This entry was posted in A Creative Life, Other's Creativity and tagged buttons, childhood, collecting, momcraft. Bookmark the permalink. Your button collection is amazing!!! 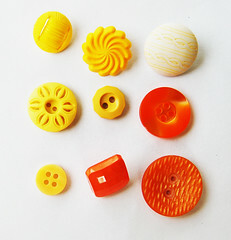 I especially love your yellow and orange collections! So juicy and happy colours. One day dd and I were talking and I told her I’d like to be 4yrs old again. She said, she’d like to be 7yrs old. My dgrc is 4yrs. old. The first dress I wore to school was brown and cream colors with the words Button Button Who’s Got The Button embrodiered on it with buttons. I really like using buttons to change the look on an outfit. I changed a baby boys coat with teddy bear pockets into a girls coat by adding two vinage buttons one on top of the other and tiny silk flowers next to the ears of the teddy bears. As always your such an inspiration and great writer. I found the search button that you spoke of at the top. Thanks for letting me know. God Bless and Grace and Peace Be Multiplied to You and Yours!!! ?h, s?dana l?ckerheter! Jag ?lskar knappar! Wonderful button collection Hanna. 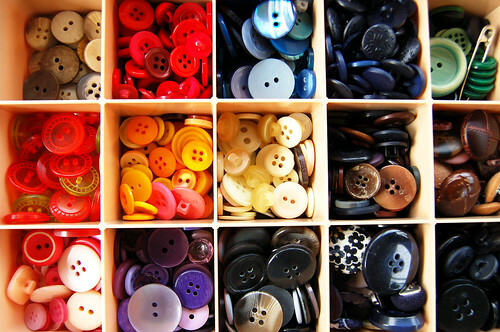 Buttons are endlessly fascinating. 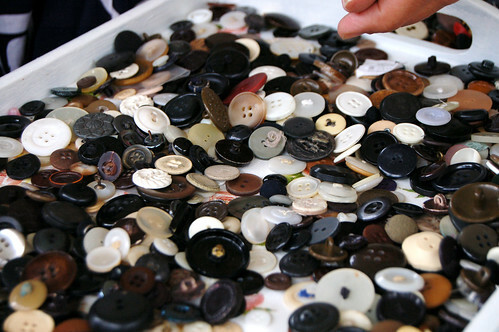 As a child I had a huge collection of buttons and I assembled all the small grey ones (boys) and small coloured ones (girls) and pretended they were children in school. I made classrooms out of narrow strips of paper and I moved the children around for their lessons. Ahh childhood…. 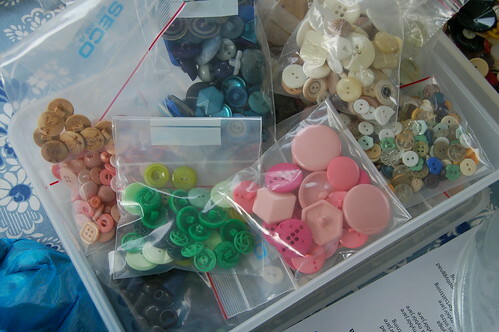 there is something therapeutic about sorting buttons, I keep a box unsorted just for the days when I feel the need to run my hands through them- maybe I’m just a little weird? christy: as I say in the text, this is not my collection, it’s my mothers, but I agree with you about the orange ones! they are juicy! Buttons are great.. I have often organized and put them into piles onto to have put them into a single container for the love of thumbing through them all to find the one! I found a website with an Evening Primrose that looks like the peachy pink shell like buttons that you have in your photo. Check it out at the link after yours that I put up on my blog when you get a chance. Hehe… n? och jag ?r v?l den enda som inte gillar knappar ocks?. Jag har nominerat dig i min blog, ?ven fast jag egentligen tycker det ?r tramsigt. how cool… they look wonderful. i just recently inhereted my great aunts button collection! Oh! Your mothers buton collection is just fabulous! Yellow buttons are the hardest to find for some reason. I hunt for button jars in antique stores here in New Hampshire and the yellows are few and far between. Thank you so much for sharing! your Mum could make a mint on Ebay! 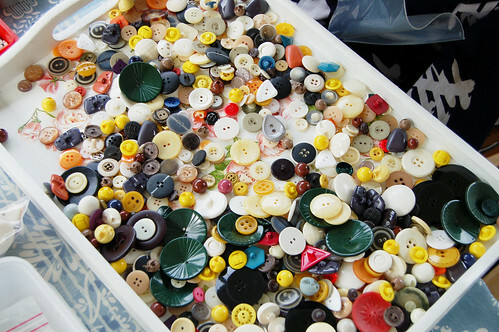 thanks for sharing – what a gorgeous button haul. Your button collection is awesome. I am doing an article on collections. Can i use a picture of your button collection? Thanks for commenting everyone! Preena, glad you asked, thanks. But I do not know what you’re writing for or where the image would be used so the answer is no, you may not use my photos. If you write me an email sometime maybe we can talk about it, but then I would have to know more about you and what you write for. Thanks!